I went looking for a cute and simple project for Valentine’s Day and found a tutorial for these heart-shaped origami page markers at the HowAboutOrange blog. How sweet! 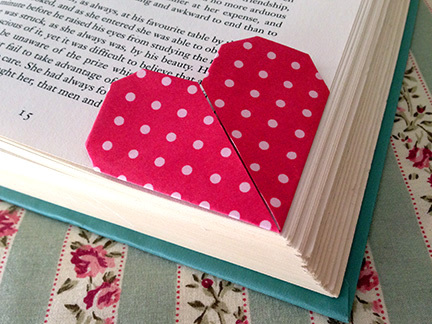 These hearts are a quick and easy fold and slip neatly over a page corner to mark your place in any book. Mine is holding my spot in “The Private Patient,” a crime novel by my favorite UK mystery author P.D. James. You only need half of a square sheet of paper for these, and I’d recommend using a 5-1/2” x 2-3/4” size piece or smaller. I started with a larger sheet and my first heart came out very pretty, but huge! I think larger hearts might make lovely Valentine’s place cards on a table, though. You could just write your loved ones’ names across the hearts and set them in the middle of your place settings. One more note: although there are not a lot of folds to these, which allows you to use just about any type of paper, for the neatest results I’d suggest using the thinnest paper you can find. I actually printed my little red and pink dot pattern onto some lightweight writing paper from an old pad that used to belong to my mother. This makes my little heart bookmark a sweet reminder of her as well.